This Primer is intended to serve as an introduction to and detailed overview of the "Transformational Government Framework" (TGF) - a practical "how to" standard for the design and implementation of an effective program of technology-enabled change at national, state or local government level. It also covers the Framework's rationale, purpose, scope, and intended use. The Framework is a managed process of ICT-enabled change in the public sector, which puts the needs of citizens and businesses at the heart of that process and which achieves significant and transformational impacts on the efficiency and effectiveness of government.
. Part I, including an Introduction and Overview, sets out the context in which the TGF has been produced, its purpose, and the principal users at whom the Framework is aimed.
. Part II describes the Transformational Government Framework itself, including the conformance criteria by which users of the Framework may determine if they are conformant.
. Part III provides a set of Guidance Notes providing further information to users of the TGF on how they can implement it in practice. This document was last revised or approved by the OASIS Transformational Government Framework TC on the above date. The level of approval is also listed above. Check the "Latest version" location noted above for possible later revisions of this document. Technical Committee members should send comments on this document to the Technical Committee's email list. Others should send comments to the Technical Committee by using the "Send A Comment" button on the Technical Committee's web page at http://www.oasis-open.org/committees/tgf/. Transformational Government Framework Primer Version 1.0. 11 January 2012. OASIS Committee Note 01. http://docs.oasis-open.org/tgf/TGF-Primer/v1.0/cn01/TGF-Primer-v1.0-cn01.html. Copyright (c) OASIS Open 2012. All Rights Reserved.
. An overview with top-level description of the key components of the TGF with context on why each is important. All around the world, governments at national, state, and local levels face huge pressure to do "more with less". Whether their desire is: to raise educational standards to meet the needs of a global knowledge economy; to help our economies adjust to financial upheaval; to lift the world out of poverty when more than a billion people still live on less than a dollar a day; to facilitate the transition to a sustainable, inclusive, low-carbon society; to reduce taxation; or to cut back on public administration; every government faces the challenge of achieving their policy goals in a climate of increasing public expenditure restrictions. Responding effectively to these challenges will mean that governments need to deliver change which is transformational rather than incremental. During much of the last two decades, technology was heralded as providing the key to deliver these transformations. Now that virtually every government is an "e‑Government" - with websites, e‑services and e‑Government strategies proliferating around the world, even in the least economically developed countries - it is now clear that Information and Communication Technologies (ICT) are no "silver bullet". The reality of many countries' experience of e‑Government has instead been duplication of ICT expenditure, wasted resources, no critical mass of users for online services, and limited impact on core public policy objectives. An increasing number of governments and institutions are now starting to address the much broader and more complex set of cultural and organizational changes which are needed if ICT is to deliver significant benefits in the public sector. Countries such as the UK, Canada and Australia have all recently published strategies which shift decisively away from "e‑Government" towards a much more radical focus on transforming the whole relationship between the public sector and users of public services. In the same vein, the European Commission has updated and published its 'European Interoperability Framework' (EIF) and several US agencies are looking to update and consolidate the 'Federal Enterprise Architecture' (FEA) into a new 'Unified Government Enterprise Architecture Framework' (UGEAF). This definition deliberately avoids describing some perfect "end-state" for government. That is not the intent of the Transformational Government Framework. All governments are different: the historical, cultural, political, economic, social and demographic context within which each government operates is different, as is the legacy of business processes and technology implementation from which it starts. So the Transformational Government Framework is not a "one-size-fits-all" prescription for what a government should look like in future.
. They focus less on service customers as passive recipients of services and more with citizens and businesses as owners of and participants in the creation of public services. Most governments are structured around a set of vertically-integrated silos or stovepipes - agencies, departments, ministries. By and large, it is these silos which the Governments of developed countries have spent billions of dollars "e‑enabling" since the 1990s. However, this is an ICT investment strategy which is fundamentally not customer-focused, because the needs of citizens, businesses and others cut across the organisational structures and hierarchies of government. It has inevitably resulted in low levels of take-up for e‑services. Governments in developed countries are now grappling with the legacy of thousands of fragmented, silo-focused websites: more than 270,000 in the US public sector, 9,000 in Germany, and 3,000 in the UK. An increasing number of governments are now seeking to make a fundamental strategic shift, towards a holistic, customer-centred approach, driven at the whole-of-government level. This shift includes, in leading countries, a move to a customer-centric "one‑stop service" delivered over multiple channels. People's experience of new technologies is shaped by the best that the private sector has to offer globally and - increasingly - through the ability to co-create content and services as individuals or in peer-to-peer networks. They will demand ever greater interactivity and ownership in their relationship with public services. Transformational Government programs embrace this. Where traditional e‑Government programs focused on the user as "the customer", Transformational Government enhances the relationship between government, citizen, and business on a richer, more reciprocated, and more empowering basis.
. doing so in ways which not only duplicate expenditure, but which also will not inter-operate with other agencies - making it more difficult and expensive to move towards inter-agency collaboration in future. A key focus of Transformational Government is therefore to move towards a service-oriented and building-block approach to ICT and back-office service architecture across all parts of government - reaping efficiency gains while at the same time enabling better, more customer-focused service delivery. As "cloud computing" gains traction and momentum, this approach opens up even greater scope to achieve large-scale efficiency savings while simultaneously improving organizational agility.
. structures, governance, funding & culture which are all organized around specific business functions, not around meeting customer needs in a holistic way.
. Service and technology solution providers to the public sector.
. Professional bodies that support industry sectors by the development and maintenance of common practices, protocols, processes and standards to facilitate the production and operation of services and systems within the sector, where the sector needs to interact with government processes and systems.
. Academic and other researchers working in the field of public sector reform.
. Civil society institutions engaged in debate on how technology can better enable service transformation. As discussed above, a "one-size-fits-all" approach to public sector reform does not work. Nevertheless, there are some guiding principles which 10-15 years of experience with e‑enabled government around the world suggests are universal. They are based on the experience of many OASIS member organizations working with governments of all kinds, all around the world, and they form the heart of the Framework. In the Transformational Government Framework, we use the term "principle" to mean an enduring statement of values which can used on a consistent basis to steer business decision making over the long term. The principles used in the TGF are detailed in Part II below.
. technology management based on the principles of service-oriented architecture. Part II of the Primer below describes frameworks for each of these areas, and Part III gives further guidance on how to implement them. Programs and projects which seek to deliver Transformational Government face significant risks to successful delivery. Typically, these risks are not related to the technology itself – which is largely mature and proven – but rather to business and cultural changes. Such changes are needed within government to deliver the business management, customer management and channel management transformations described in Component 3 of the TGF. However, there is now an increasing body of research which seeks to understand why some ICT‑enabled transformation programs succeed and why others fail. The TGF therefore includes nine Critical Success Factors that reflect and respond to the findings of such research, validated with OASIS members around the world. These Critical Success Factors need to be taken on board by any government seeking to develop and deliver an effective Transformational Government program. The Benefits Realisation Framework is needed to ensure that the Transformation Government program ultimately delivers all of its intended benefits and impacts in practice. Logically, the design and delivery of a Benefits Realisation Strategy is a part of the Business Management task, and is a core responsibility for the Transformational Government Leadership and the collaborative stakeholder governance model described in the TGF Business Management Framework. It is of such vital importance however that it is highlighted as a distinct component of the overall Framework.
. Failure to pro-actively manage the downstream benefits after an individual ICT project has been completed. Often, ICT projects are seen as "completed" once the technical implementation is initially operational. In order to reap the full projected benefits (efficiency savings, customer service improvements etc. ), on‑going management is essential, often involving significant organizational and cultural changes. A study for the European Commission calculated that, as a rule of thumb, organizational change accounts for 55% of the full costs of e‑Government projects in Europe, while ICT only accounts for 45%. Yet these organisational change costs are often not fully factored in or delivered, resulting in a failure to maximize the potential benefits of the ICT investments.
. Failure at a whole-of-Government level to undertake the restructuring of the public labour market to take advantage of new efficiencies. Effective delivery of e‑Government services – both externally in service delivery to citizens and businesses and internally in modernising the operations of government – opens up the potential to reduce significantly the cost of government. As the cost of delivering government services falls, so governments need to plan and implement the necessary restructuring of the public sector labour market to realize efficiency benefits in the traditional paper-based channels. These efficiency savings can then either be returned to the tax payer in the form of lower taxes, or recycled into priority front-line public services such as health and education. A study by the OECD in 2006 showed that this "whole-of-government" approach to efficiency savings had until that point been a feature of only a few countries, notably Canada, the UK and Finland. Increasingly though, financial pressures are forcing governments to focus on this issue. The Transformational Government Framework does not seek to specify in detail what benefits and impacts a Transformational Government program should seek to achieve – that is a matter for each individual government. However, the TGF does set out a best practice approach to benefits realisation. Each of these components is described in more detail below. These components, together with the main concepts that they encompass, are expressed in a more formal structure as a set of "patterns" in the related "Core Patterns" of the TGF Pattern Language [TGF-PL-Core]. The TGF Guiding Principles are set out below, and must be used by any Transformational Government program conforming to the Framework. These principles together represent an enduring statement of values which the Leadership for a Transformational Government program should adopt and use consistently as a basis to steer business decision-making throughout the conception, development, implementation and follow-up of that program. These are explicitly declaratory statements of principle ("We believe...") that reflect the desired commitment of the program Leadership as well as indicating the expectations from all Stakeholders.
. Partnerships should be built with other market players (in the private, voluntary and community sectors) in recognition of their significant influence on customer attitudes and behaviour and enable the market and others to work with government to deliver jointly-owned objectives. These nine factors are covered in Component 2 of the TGF. A high-level map of these delivery processes and how their constituent elements interact is illustrated in summary below. 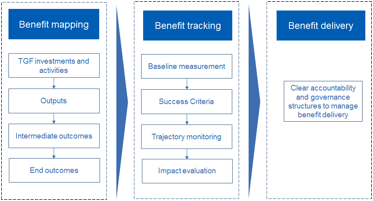 The following sections then look in more detail at each of the four delivery processes, setting out the best practices which should be followed in order to ensure conformance with the Transformational Government Framework.
. A Roadmap for Transformation: giving a four to five year view of how the program will be delivered, with explicit recognition of priorities and trade-offs between different elements of the program. - Engagement of a broad-based leadership team across the wider government. Further guidance on how to implement this process is given in Part III (a) of the Primer.
. Stakeholder Empowerment: the internal cultural changes and external market-enabling actions which enable governments to engage with citizens and businesses as active co-creators of public services, rather than their passive recipients. 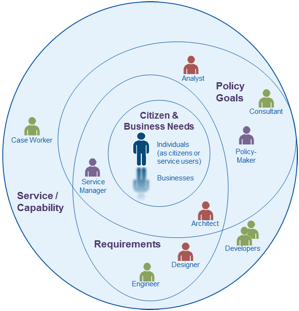 MUST have a Stakeholder Empowerment Framework, which encourages and enables service innovation in the Citizen-to-Citizen, Business-to-Citizen, and Citizen-to-Government sectors. Further guidance on how to implement this process is given in Part III (b) of this TGF Primer.
. Channel Mapping: a clear audit of what channels are currently used to deliver government services. 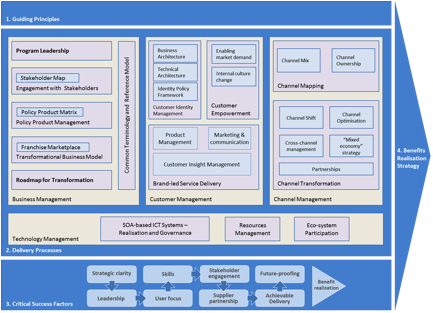 The TGF Channel Mapping approach includes an analysis of these channels across two key dimensions: which delivery channels are being used ('channel mix') and who owns them ('channel ownership'). - development of a "Mixed Economy" in service provision through private and voluntary sector intermediaries. - Developing a thriving mixed economy in the delivery of government services by private and voluntary sector intermediaries. Further guidance on how to implement this process is given in Part III (c) of this TGF Primer. Further guidance on how to implement this process is given in Part III (d) of this TGF Primer. Conformant Transformational Government programs manage and measure these Critical Success Factors throughout the life of the program.
. All-of-Government view: Transformational government cannot be pursued on a project-by-project or agency-specific basis but requires a whole-of-government view, connecting up relevant activities in different agencies at different levels of government within and between countries.
. Clear vision: all program stakeholders have a common, agreed and comprehensive view of what the program is seeking to achieve. In particular, we do not spend money on technology before identifying the key organizational and business changes needed to deliver our vision.
. Strong business case: we know what outcomes we want to achieve, have base-lined where we are now, and know how we will measure success.
. Focus on results: although we have a vision of where we want to go, and a set of principles by which we will move forwards, we do not over-plan. Instead, our strategy focuses on taking concrete, practical steps in the short to medium term, rather than continually describing the long-term vision.
. Sustained support: political leaders and senior management are committed to the program for the long term. This is particularly relevant given the realities of changing political leadership and underlines the need for continuity across those changes.
. Collaborative governance: leaders from all parts of our and other organizations involved in the program are motivated for it to succeed, and are engaged in clear and collaborative governance mechanisms to manage any risks and issues.
. A holistic view of the customer: we understand who the customers for our services are - not just for individual services - but across the Government as a whole. We know our customers, both internal and external, are different - and understand their needs on a segmented basis.
. Customer-centric delivery: customers can access all our services through a "one-stop service". This is available over multiple channels and that respond to different needs, but we use web-based services to join it all up and reduce infrastructure duplication, and we encourage customers into lower cost channels where possible and compatible with individual needs (such as accessibility).
. Stakeholder empowerment: we engage customers directly in service design and delivery, and provide them with technology tools that enable them to create public value themselves.
. Stakeholder communication: all our stakeholders - users, suppliers, delivery partners elsewhere in the public, private and voluntary sector, politicians, the media, etc. - have a clear understanding of our program and how they can engage with it.
. Cross-sectoral partnership: other market players (in the private, voluntary and community sectors) often have much greater influence on customer attitudes and behaviour than government - so our strategy aims to build partnerships which enable the market to deliver our objectives.
. Skills mapping: we know that the mix of business change, product and marketing management, program management, and technology skills needed to deliver transformational change does not already exist in our organisation. We have mapped out the skills we need, and have a clear strategy for acquiring and maintaining them.
. Skills integration: we have effective mechanisms in place to maximize value from the skills available in all parts of our delivery team, bringing together internal and external skills into an integrated team.
. Smart supplier selection: we select suppliers based on long-term value for money rather than price, and in particular based on our degree of confidence that the chosen suppliers will secure delivery of the expected business benefits.
. Supplier integration: we will manage the relationship with strategic suppliers at top management level, and ensure effective client/supplier integration into an effective program delivery team with shared management information systems.
. Interoperability: Wherever possible we will use interoperable, open standards which are well supported in the market-place.
. Agility: we will deploy technology using common building blocks which can be re-used to enable flexible and adaptive use of technology to react quickly to changing customer needs and demands.
. Shared services: key building blocks will be managed as government-wide resources - in particular common customer data sets (e.g. name, address); applications and application interfaces (e.g. authentication, payments, notifications); and core ICT infrastructure. - learns from experience, and then drives forward longer term transformations.
. Benefits realisation strategy: we have a clear strategy to ensure that all the intended benefits from our Transformation Program are delivered in practice, built around the three pillars of benefit mapping, benefit tracking and benefit delivery.
. Benefit Delivery: which ensures that governance arrangements are in place to ensure continued benefits after the initial transformation program is implemented. The relationship between these parts and conformance criteria for this element of the TGF are shown below. 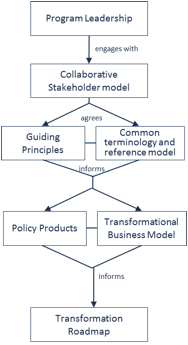 The Business Management Framework of the TGF includes formal terminology and a reference model in order to ensure that all stakeholders have a clear, consistent and shared understanding of the key concepts involved in Transformational Government; how these concepts relate to each other; how they can be formally modelled; and how such models can be leveraged and integrated into new and existing information architectures. This enables any conformant agency to use a common terminology without ambiguity and be sure that these terms are used consistently throughout all work. Some key concepts are already introduced below. Further guidance on how the terminology is composed and how a reference model may be used is given in Part III (a) of this Primer. A policy prescription that aims at ensuring that people with disabilities and the elderly can use public services with the same service levels as all other individuals. Any natural or legal person (a citizen or a business) who uses a public service. Standard SOA terminology refers to "consumer" but "customer" is to be preferred in order to highlight a more active role than is implied by (the more passive term) consumer. A collaborative organisation created by the government with the purpose of: understanding the needs of a specific customer segment for government services (such as, for example, parents, motorists, disabled people, land and property); championing the needs of that segment within government; aggregating content and transactions for that segment from across government and beyond; and delivering that content and services as part of the wider Franchise Marketplace. Some person or agent acting with authority on behalf of another person. The virtual business infrastructure within which Customer Franchises collaborate with each other and other stakeholders to deliver user-centric, trusted and interoperable content and transactions to citizens and businesses. 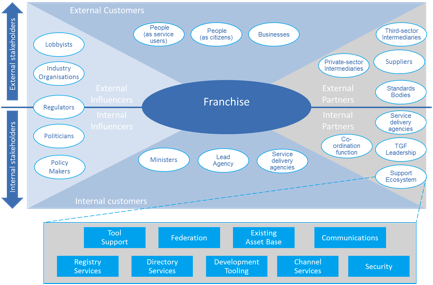 The Franchise Marketplace is the business model recommended by the TGF for best delivering the TGF Guiding Principle of "Build services around customer needs, not organisational structure". A policy prescription that aims at allowing everyone to take full advantage of the opportunities offered by new technologies to overcome social and economic disadvantages and exclusion. The ability of disparate and diverse organisations to interact towards mutually beneficial and agreed common goals, involving the sharing of information and knowledge between the organisations, through the business processes they support, by means of the exchange of data between their respective ICT systems. A service designed around the needs of citizens and businesses. Such a service brings content and transactions from a wide number of different government agencies, and from different layers of government, enabling them to be integrated as a "one stop" point of service delivery, according to common service standards and with common marketing and communication. The set of mechanisms for ensuring and enhancing trust and confidence in a system. A paradigm for organizing and utilizing distributed capabilities that may be under the control of different ownership domains. We envisage issuing further guidance over time, but this initial set of guidance notes is intended to give a deeper view of the context for these major elements of the TGF, and to highlight best practice approaches to its implementation. For largely historical reasons, governments are generally organised around individually accountable vertical silos (for example, tax, health, transport) with clear demarcations between central, regional, and local government. 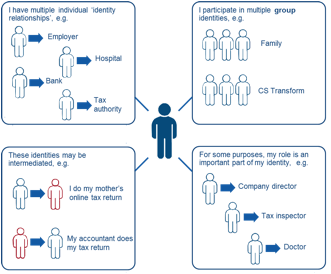 Even within a particular tier of government, several organisations can have responsibility for different aspects of the same person, same asset or same process. Yet citizen and business needs cut across these demarcations. 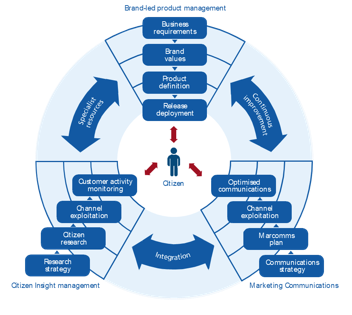 In moving to a customer-centric approach, it is vital to redress this fragmented approach to business management, and to put in place business management processes which operate at the whole-of-government level. A high level view of the logical relationships between these components is illustrated below. Transformation programs require sustained leadership over a period of years.
. A clear focus of accountability: at both the political and administrative levels there should be an explicit functional responsibility for the Transformation Program. These functions should be occupied by individuals with sufficient authority to command the resources and mobilise the support necessary to fulfil this mission.
. Deployment of formal program management disciplines: to deliver effective‑Government-wide transformation, it is vital to use a formalised program management approach, such as PRINCE 2.
. Ensuring the right skills mix in the leadership team. Effective leadership of a Transformation Program requires the senior accountable leaders to have access to a mix of key skills in the leadership team which they build around them, including: strategy development skills, stakeholder engagement skills, marketing skills, commercial skills and technology management skills. Deployment of a formal competency framework such as SFIA can be helpful in identifying and building the right skill sets.
. Building a broad-based leadership team across the wider government. It is not essential that all Ministers and senior management are committed to the transformation program from the outset. Indeed, a key feature of an effective roadmap for transformation is that it nurtures and grows support for the strategy through the implementation process. However, it is important that the program is seen not simply as a centralised or top-down initiative. Sharing leadership roles with senior colleagues across the Government organisation is therefore important. Further detail on this is set out in the section below on a collaborative stakeholder model. Development and delivery of an effective Transformational Government program requires engagement with a very wide range of stakeholders, not only across the whole of government but also with the private sector, voluntary and community sectors as well as with business and citizen users of public services. A significant effort is needed to include all stakeholders in the governance of the Transformational Government program at an appropriate and effective level. Key elements are set out below that a conformant TGF program will need to address in developing its Collaborative Stakeholder Governance Model, if it is to engage successfully with stakeholders and align them effectively behind shared objectives. Each of these elements is then discussed in more detail. This view deliberately and completely avoids the rather generic concept of 'User' that is dominant in traditional IT stakeholder engagement models, preferring rather to identify the different interests and concerns that are at stake (the mauve labels) and the key groups of stakeholders (the different people icons) in the development of any service. The figure is by no means complete nor the only 'valid' view. It seeks instead to illustrate that the process of transformation requires reappraisal of the current set-up and assessment of what needs to change.
. Citizen and Business Needs that, ultimately, can only be fully understood by the people concerned themselves – nonetheless stakeholders at this level can also include citizen or business associations, consumer and other interest groups who engage with policy makers to advance the interests of certain groups with distinct needs and are able to articulate those needs in ways that can be used by analysts and consultants. The various ellipses in the diagram above are deliberately not concentric circles. This is to underline that the process of establishing a service or capability is not a linear one going from needs, goals and requirements. In reality stages are often inter-related. The mapping of stakeholders and their principal concerns at a generic level is used as a key input to the TGF reference model outlined in the next section and that needs to be validated within any TGF program. It is valuable as a tool for encouraging collaborative governance as it renders explicit many of the relationships and concerns that are often left implicit but nonetheless impact on an organisation's ability to reflect stakeholders' concerns. - collaborative product development processes. - alignment between public policy objectives and the commercial objectives of private sector partners. There is no one right model for doing this successfully, but any conformant TGF program needs to make sure that it has used the framework above to define its own Collaborative Stakeholder Engagement Model which explicitly articulates all of these elements: a comprehensive stakeholder map, coupled with the structures, processes and incentives needed to deliver full understanding and buy-in to the program, plus effective stakeholder action in support of it. The model clearly focuses attention within any specific TGF program. However (and increasingly) collaboration is required also between governments and, by implication, between TGF programs. In the figure below, we see that collaboration between TGF programs is favoured at the political, legal and organisational levels and only later, if and when necessary, at the more 'tightly-coupled' semantic and technical levels. This approach is also consistent with the SOA paradigm for service development – not only are requirements defined and services offered independently of any underlying technology or infrastructure but also one TGF program can be seen (and may need to be seen) as a 'service provider' to another TGF program's 'service request'. For example, a business wishing to establish itself in a second country may need to provide authenticated information and credentials managed by government or business in the first country. A further advantage of this approach is that it becomes easier to identify and manage high level government requirements for services: whether in the choice of ICT standards that may need to be used to address a particular technology issue or determining the criteria for awarding public procurement contracts, this approach allows a 'loose-coupling' at the level of clearly defined high-level policy needs rather than the more tightly-coupled and often brittle approach of specifying particular technologies, software or systems. In any change program of this breadth and complexity, it is vital that all stakeholders have a common understanding of the key concepts involved and how they interrelate, and have a common language to describe these in. We therefore recommend that a TGF-conformant transformation program should seek to agree with stakeholders a common Terminology and Transformation Reference Model. Why have a terminology and reference model? In everyday life, we use terms – 'citizen', 'need', 'service' – as common, often implicitly accepted labels for concepts. The concept is the abstract mental idea (which should be universal and language independent) to which the term gives a material expression in a specific language. Particularly in an international environment such as global standardization initiatives, the distinction is important as it is common concepts that we wish to work with, not common terms. Concepts do not exist in isolation, however. It is the broader understanding of the relationships between concepts that give those concepts fuller meaning and allow us to model our world, our business activities, our stakeholders, etc. in a way that increases the chance that our digital systems are an accurate reflection of our work. In information science, an ontology is a formal representation of knowledge as a set of concepts within a domain, and the relationships between those concepts. It can be used to describe the domain (the coverage should be sufficiently comprehensive to include all concepts relevant to the domain) and to reason about the domain. The TGF does not include a formal ontology but is sufficiently clear in its concepts, definitions and relationships between concepts that the Framework will use consistently as an internally coherent set. It does include however a "reference model" that is clear enough that subsequent ontology development is possible if so desired. The TGF Primer already includes formal definitions of key concepts used throughout the Framework and a complete terminology and reference model – that formalizes the concepts and the relationships between them – is prepared as a separate deliverable. A central task of the TGF leadership and collaborative stakeholder model is to develop a new and effective business model which enables the machinery of government to deliver customer-centric "one stop services" in practice. It is failure to address this requirement for a new business model which, arguably, has been the greatest weakness of most traditional e‑Government programmes. 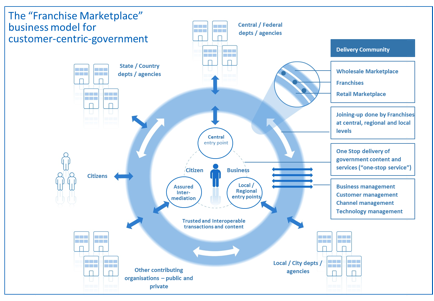 For the most part, the transition to e‑Government has involved overlaying technology onto the existing business model of government: a business model based around unconnected silos - in which policy-making, budgets, accountability, decision-making and service delivery are all embedded within a vertically-integrated delivery chain based around specific government functions. The experience of governments around the world over the last two decades is that this simply does not work. So what is the new business model which is required to deliver transformational government? Many attempts have been made by governments to introduce greater cross-government coordination, but largely these have been "bolted on" to the underlying business model, and hence experience only limited success.
. The model puts into place a number of agile cross-government virtual "franchise businesses" based around customer segments (such as, for example, parents, motorists, disabled people). These franchises are responsible for gaining full understanding of their customers' needs so that they can deliver quickly and adapt to changing requirements over time in order to deliver more customer centric services - which in turn, is proven to drive higher service take-up and greater customer satisfaction. - Acting as change agents inside‑Government departments / agencies. - secondly by deploying 'Web 2.0' type approaches across government that promote re-use and 'mash-ups' of existing content and services, to make this simpler and cheaper at a technical level. This Franchise model represents an important break-through in the shift from a traditional e‑Government approach towards transformational government. Certainly, the model as a whole or key elements of it has been adopted successfully in governments as diverse as the UK, Hong Kong, Croatia, Abu Dhabi and Australia (where it has been adopted by both the South Australia and Queensland governments). It is clearly possible that alternate models may develop in future. But however the Transformational Government agenda develops, every government will need to find some sort of new business model along these lines, rather than continue simply to overlay technology onto an old silo-based business model built for an un-networked world.
. Customers: Those citizens and businesses to whom the franchise delivers content and services, plus those internal stakeholders to whom the franchise provides a service within the government.
. Partners: Those who are actors in the normal operation and delivery of the service, both internally and externally to the government.
. Influencers: those who have a political, business or altruistic interest in the service and the part that it plays in broader government, business and social scenarios.
. Internal Customers: Those who work with the franchise to develop and maintain the service. The franchise is based around a customer segment. It may contain bodies drawn from central, regional, and state government and others that contribute to serving that segment. It MUST have a lead organisation that ensures its interests are represented to other franchises and bodies. It MUST also have sponsoring organisations that with a responsibility for the full range of service perspectives across the segment. The franchise is responsible for ensuring that all relationships with external bodies are managed and for the provision of supporting assets necessary to allow organisations within the franchise and working with it to discharge their responsibilities in an open, consultative and transparent manner. Despite the importance of the franchise concept, it is not intended to add unnecessary bureaucracy – rather, it is intended to provide a lightweight framework within which participants can work naturally and cooperatively. Customers are the most important actors in operational services as the services MUST address their needs and those of the people that they represent. Thus, as well as being users, it is essential that they are consulted during the proposal stage for all services. Once operational, this group SHOULD to be involved in customer satisfaction exercises and the development of any service enhancements to ensure that their needs continue to be met. It is vital that Franchises identify their internal government customers and apply similar customer research and customer satisfaction measurement to these internal customer relationships as well as to external ones.
. providing the supporting assets which give a technical underpinning for this and other services. The supporting assets provide the technical underpinning for project delivery. Where they are publically owned, it is intended that they will provide light-touch governance and facilities (primarily technical) to support franchises and inter-working between them and with standards bodies. It is essential that they ensure the provision and availability of assets that are universal (i.e. fundamental items that are required by all public sector organisations) or common (i.e. assets used across multiple franchises). Tooling SHOULD to be provided with the aim of supporting all stakeholders and facilitating their collaboration. The influencers are those who identify, and possibly mandate, the need for a service. Accordingly, it is vital that they are able to steer developments within and across franchises. They also have a responsibility to ensure that all stakeholders are aligned and are organisationally capable of discharging their responsibilities. We define a "Policy Product" as: any document which has been formally adopted on a government-wide basis in order to help achieve the goals of transformational government. These documents vary in nature (from statutory documents with legal force, through mandated policies, to informal guidance and best practice) and in length (some may be very lengthy documents; others just a few paragraphs of text). Policy Products are important drivers of change within government: first because the process of producing them, if managed effectively, can help ensure strategic clarity and stakeholder buy-in; and second because they then become vital communication and management tools. Over recent years, several governments have published a wide range of Policy Products as part of their work on Interoperability Frameworks and Enterprise Architectures, and other governments are therefore able to draw on these as reference models when developing their own Policy Products. However, we believe that the set of Policy Products required to ensure that a holistic, government -wide vision for transformation can be delivered is much broader than is currently being addressed in most Interoperability Frameworks and Enterprise Architectures. 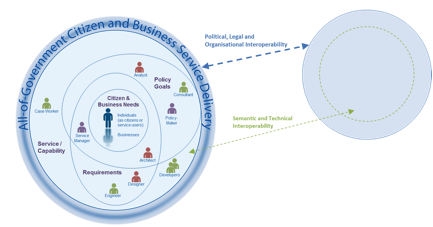 A TGF-conformant transformation program will use the matrix shown below to create a map of the Policy Products that are needed to deliver the program effectively. This matrix maps the four delivery processes described in Component 2 of the TGF (Business Management, Customer Management, Channel Management and service-oriented Technology Management) against the five interoperability domains identified in what is currently the broadest of Interoperability Frameworks - the European Interoperability Framework (EIF): technical, semantic, organisational, legal and policy interoperability. While the EIF framework is conceptually complete, by mapping it against these core delivery processes, a much clearer sense can be gained of the actions which are needed. A full analysis of the Policy Products which we recommend are typically needed to deliver an effective and holistic transformation program will be included in a separate Committee Note "Tools and Models for the Business Management Framework". Although the detailed Policy Products in that note are advisory and not all of them may be needed, any conformant transformation program MUST use the overall framework and matrix of the Policy Product Map in order to conduct at minimum a gap analysis aimed at identifying the key Policy Products needed for that government, taking the Committee Note into account as guidance. Finally, it is essential that the vision, strategy, business model and policies for transformational government are translated into an effective Roadmap for Transformation. Since everything can clearly not be done at once, it is vital to map out which elements of the transformation programme need to be started immediately, which can be done later, and in what order. There is no one-size-fits all strategy which governments can use, since strategy needs to be tailored to the unique circumstances of each government's situation. However, all governments face the same strategic trade-offs: needing to ensure clear line-of-sight between all aspects of programme activity and the end outcomes which the Government is seeking to achieve, and to balance quick wins with the key steps needed to drive longer term transformation. 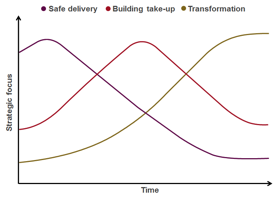 In the early days of the Transformational Government program, we recommend that the major strategic focus should be on safe delivery - that is, prioritising high benefit actions which help to accelerate belief and confidence across the Government and the wider stakeholder community that ICT-enabled change is possible and beneficial - but which can be delivered with very low levels of risk. As the programme develops, and an increasing number of services become available, the strategic focus can move towards building take-up: that is, building demand for online services and creating a critical mass of users. Once that critical mass starts to appear, the strategic focus can start to shift towards fuller transformation: in other words, to start driving out some of the more significant transformational benefits that high levels of service take-up enables, for example in terms of reducing the cost of government service delivery. As the diagram below makes clear, these strategic foci are not mutually exclusive, but overlap. Crucially, in the Safe Delivery phase there will also be some vital steps needed in order to pave the way for longer term transformation, particularly in respect of establishing the business case for transformation, and embedding the strategy in effective governance processes. But the diagram shows how the strategic weight between each consideration should shift over time. Guided by the strategic trade-off framework described above, experience shows that a phased approach is the most successful. Typically, an effective Delivery Roadmap will cover five main phases. - A high level benefits realisation plan, setting out the actions needed to ensure full downstream delivery of the intended benefits from the transformation programme.
. selecting effective delivery partners. Finally, the program looks to build out the broader range of e-transformation projects, drive forward the migration of all major customer-facing services towards the new one-stop channels, and complete the transition to the full strategic IT platform needed to guarantee future agility as business and customer priorities change.
. Real-time, event-level understanding of citizen and business interactions with government should be developed"
Putting these principles into practice involves taking a holistic, market-driven approach to every step of the service design and delivery process. This in turn often requires new skills and management practices to be brought into government. The TGF Customer Management Framework draws together best practice on how to do this. Marketing is critical to effective transformational government, yet is something at which government traditionally does not excel. Often, marketing is fundamentally misunderstood within government - as being equivalent to advertising or perhaps, more broadly, as being equivalent to communication. This is the process that a brand-led consumer product company such as Proctor and Gamble or Virgin would go through when developing a new product. However, it is not typically how governments manage their own service development, and governments generally lack the skills to do it. Moreover, the challenge faced by governments is significantly more complex than any private sector company, given the greater range and complexity of services and governments need to provide a universal service rather than pick and choose its customers. Yet if governments are to succeed in the ambition of shifting service delivery decisively away from traditional channels to lower-cost digital channels, then these marketing challenges have to be met. And given the fact that a) customer needs cut across organisational boundaries in government and b) the skills for delivering an effective brand-led marketing approach to service transformation will inevitably be in short supply, it is important that these challenges are addressed at a government-wide level. Customer insight must inform all aspects of the process, and involves a comprehensive programme of qualitative and quantitative research to understand and segment the customer base for government services. The learnings from this need to be fed into a brand-led product management process - not as a one-off input of initial research, but through a continuous process of iterative design and customer testing. A key output from this will be a set of brand values for the service, which then need to drive all aspects of service delivery, and marketing communications for the service. This is an iterative process of continuous improvement, not a linear one. Continuous customer insight research is needed to ensure that both the service delivery experience and the marcoms activity remain aligned with the brand values, through successive phases of release deployment. As the service is implemented, across a range of channels, best practice management information systems can be deployed to ensure that the Government now has real-time, event-level management information about the experience of all customers - which in turn provides a powerful feedback loop into further innovation in the service design. Often, this will require the Government to bring in specialist resources, because typically it may face significant gaps in terms of the people and skills needed to manage brand-led product development and marketing cycles of this nature. Identity management is a key enabler, yet something with which most governments struggle. At the heart of that struggle is often a failure to put the customer at the centre of government's thinking about identity. A wide range of agencies, standards bodies and advocacy groups are deeply involved in many aspects of this work, from technical models for privacy management (such as the OASIS PMRM technical committee) through to the business, legal and social issues around online identity assurance (such as promoted by Open Identity Exchange, OIX). It is not the purpose of the Transformational Government Framework to address the details of identity management or recommend specific policies or approaches but rather to give high-level guidance on the main issues that a conformant program should seek to address. Identity is a complex, and by definition deeply personal, concept. As the following figure illustrates, a single person in fact has multiple, overlapping "identities". Each identity may be associated with different rights and permissions, even different addresses. These identities overlap, but in some cases the individual concerned may want to keep them separate in order to protect his or her privacy. At other times, he or she may want them to be joined up, and be frustrated at constantly having to furnish government with the same information over and over again. Governments have often struggled to manage this complexity. Typically, identity is defined separately in relation to each silo-based government service. Even countries which have traditionally had the simplicity of a single citizen identifier (such as Finland, where there has been a single population register since 1634), have tended to build up separate and inconsistent business processes for identity verification. Although the advent of e‑Government held out the promise of significant simplification of identity management - bringing service improvement gains for the customer and efficiency savings for the Government - significant barriers remain. These include legal barriers that have grown up over centuries of piecemeal approaches taken by public administrations (as well as, more recently, also by the private sector) and put in place often to protect individuals from the effects of equally piecemeal processes. As such the impact of any changes must be considered very carefully. Many of the tools which governments have put in place to guarantee security in the online world (passwords, PINs, digital signatures etc), have in practice acted as barriers to take-up of online services. And attempts to join up databases to enable cross-government efficiencies and service improvements have often been met with mistrust and suspicion by users. Increasingly, however, a set of best practices is emerging around the world which we believe represents a way forward for transformational government, which is broadly applicable across a very wide range of governments. Firstly, a business architecture for identity management which is based on federation between a wide range of trusted organisations (the Government, banks, employers etc), and a clear model for cross-trust between these organisations. Secondly, a technology architecture to support this which does not rely on monolithic and potentially vulnerable large databases, but which, in line with the SOA paradigm, uses Internet-based gateway services to act as a broker between the different databases and IT systems of participants in the federated trust model. Thirdly - and perhaps most importantly - a customer service model for identity management which places individuals themselves directly in control of their own data, able to manage their own relationship with government – whether on their own behalf as citizens or in another identity relationship or intermediated role – and with clearly visible controls to reassure them that this is the case. 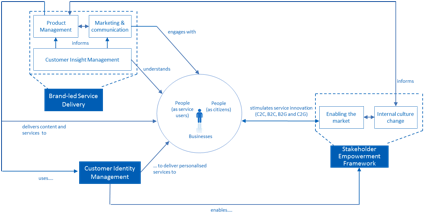 This customer-centric approach to identity management is illustrated in the figure below. No one‑Government has implemented all features of this approach, but all are being successfully deployed around the world, and together they represent our view of the approach to identity management which will best help deliver Transformational Government. We argued in Part I of the TGF that a defining feature of Transformational Government programs is that they focus on the active stakeholder not the passive "consumer" - that is, they seek to engage with citizens and businesses as owners of and participants in the creation of public services, not as passive recipients of services. Stakeholder empowerment involves a set of changes which are much more fundamental than the online consultations and "e-participation" initiatives which characterised the first wave of e‑Government programmes. It is also more fundamental than the application of the latest generation of technologies to government - although such technologies do have a role to play. * Action on the supply side within government, to help create a culture of open innovation within the public sector. Such a culture change - which reflects an increasing trend in the private sector to see external ideas and collaborations as being the key to successful innovation - is particularly challenging in the public sector given the strong tradition of internal control over decision-making and policy development. So pro-active change management is essential. - establishing a service-oriented technology architecture based around open standards and technologies which makes it easier in practical terms for third parties to re-purpose and repackage‑Government content (see Part III (d)). Transformational Government programs seek to avoid these pitfalls, by building a channel management approach centred around the needs and behaviour of citizens and businesses.
. Channel Mapping: a clear audit of what existing channels are currently used to deliver government services. 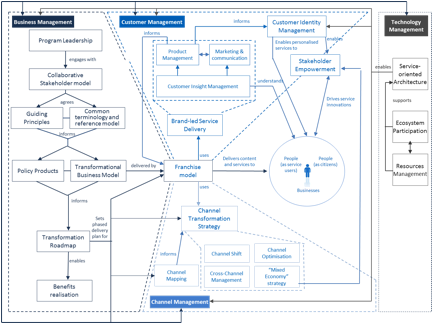 The TGF Channel Mapping approach includes an analysis of these channels across two key dimensions: which delivery channels are being used ('channel mix') and who owns them ('channel ownership'). A vital first step in developing a customer-centric channel management strategy is to carry out a mapping of existing delivery channels across government, and to put a cost to each transaction delivered through these channels based on standard industry assumptions. This will highlight duplication across government (for example, having multiple high-street locations in the same town serving different government departments or agencies), and the savings that can be achieved by joining government services together and using the most efficient delivery channel in each case. A common finding in channel audits of this type is that much contact between governments and customer is unnecessary, hidden and uncosted. For example, many governments have literally thousands of public service telephone contact numbers.
. hidden and uncosted - because only some of these customer contacts are caught by existing management information systems. The rest are just lost within the broader operational structure and budget of government. A clear map of customer interactions by channel, and the true costs of these, therefore provides essential data in building the business case for service transformation.
. Channel mix: that is, the physical type of channel being used. Traditionally, channels for government service delivery have included the face-to-face channel (through high-street and other locations), traditional mail and the traditional telephone. More recently, interactive voice recognition (IVR) and the Internet have become important channels. A key distinction is the extent to which the channel is based around self-service by the customer, or requires some form of intermediation - either in person (e.g. the customer visiting a government office or an official visiting the citizens in the community) or remotely (e.g. by telephone or email).
. Channel ownership: it is important to understand, too, the variety of "channel ownership" options which are available. Traditionally, channels for government services have been branded as belonging to a specific government agency. Increasingly, governments looking to develop a customer-centric approach have also started to badge these on a government-wide basis: either covering a single channel (such as a national government portal), or multiple channels (such as Service Canada, which spans walk-in offices, contact centres, and the web). Once a full Channel Mapping has captured the current channel mix and cost base, it is important to map out a strategy for the future desired channel mix, and the future customer experience over different channels. The key elements of this Channel Transformation Strategy are discussed below. Successful private-sector businesses are more effective at this than government. They understand that each channel opens up different ways to create value for customers, so they differentiate services across channels. They also take a hard-nosed approach to channel management, with customers being incentivised to use the channels that are most efficient from a business point of view. And they realise that channel shift is a complicated process, which needs planning over a multi-year period.
. First, government has an obligation to provide services on a universal basis, so is not able to pick and choose which customers it will engage with through different channels. "Directed choice" towards cheaper channels is therefore the strategy selected for most customer-facing services (although a number of governments are increasingly looking to make Internet-only services the norm for businesses).
. Second, in terms of the online channel, government is in a unique position compared with any other online service provider. Whereas an online bank or retailer is limited by the size of the online population in the market, a government can take action significantly to increase that online population. "Digital inclusion" policies, aimed at increasing the proportion of individuals who have access to and confidence in using online channels, are therefore an important part of government channel strategies which would not normally be seen in their private-sector counterparts. As well as seeking to shift future service delivery to an optimal channel mix, Transformational Government programs seek to optimise the performance of each individual channel. In the UK for example, a government-wide review of customer contact found that contact centre performance lagged significantly behind private sector benchmarks, and that on average operational savings of 25% could be achieved in public centre contact centres over a 3 year period by adopting best practices.
. First, to improve service to customers. Customers do not want simply want services to be available through a choice of channels. Rather they want services to be delivered in an integrated way across channels. Transformational Government programs therefore focus on achieving an integrated view of customer interactions across all channels.
. Second, to reduce costs. A shared service approach to channel management can deliver significant efficiency savings. By building channel support services around a common, web-based infrastructure, governments can both reduce costs while also facilitating joined-up services. Finally, it is essential to recognise that a customer-centric approach involves delivering services where customers want to receive them - and this may often mean that it is important to deliver services through private or voluntary sector intermediaries. This is particularly important as services become digitised, potentially reducing the marginal costs of delivery to near zero and hence making it easier for third party organisations to bundle public sector services with their own service offerings. This can be challenging for governments, however, since for the first time it means that they are "competing" for customers with other organisations. Establishing clear ground rules for how this sort of mixed economy of service provision should work, on a basis that will encourage private and voluntary sector organisations to become actively involved, is therefore an important task for government in creating the policy framework for Transformational Government and SHOULD be addressed using the Franchise Marketplace Model outlined above. 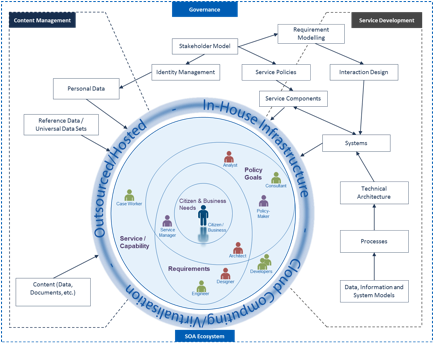 The transformations to business, customer and channel management described above require a new approach to technology and in particular a commitment to the paradigm and principles of Service Oriented Architecture (SOA) and SOA-based infrastructure, as defined in the OASIS 'Reference Model for Service-Oriented Architecture [SOA-RM]. Transformational Government demands a single view of the citizen or business, delivered inside an integrated business and channels architecture. In terms of ICT, all of this requires governments to learn from private-sector best practice. Industry is moving towards a model of company-wide, service-orientated enterprise architecture, where common building blocks using open standards can be re-used to enable flexible and adaptive use of technology to react quickly to changing customer needs and demands. Increasingly, companies are gaining even greater efficiency benefits by managing these building blocks as a service, provided not only from within their own ICT architecture but also from within "the Cloud" - the dynamically-scalable set of private and public computing resources now being offered as a service over the Internet. Governments are increasingly taking this 'building block' approach to technology development. Key building blocks such as ICT infrastructure, common data sets, and identity verification need to be co-ordinated effectively. While much can be learned from the private sector, simply importing industry practices will not solve this coordination problem within government. Governments are taking different approaches to the co-ordination function: some build central infrastructure for use by all departments and agencies; others identify lead departments to build and implement common solutions; others have a more decentralised approach, allowing departments to develop their own solutions according to a common architecture and standard set. However, finding an effective approach which works within a specific government is vital, since without this sort of technology flexibility, then Transformational Government becomes impossible - or possible only at great expense and with significant wasteful and duplicated ICT expenditure. The Technology Management Framework is modelled as one of the four TGF delivery processes, but it is concerned with more than "just" the delivery of services using ICT. Its focus on the SOA paradigm is key to an approach that puts citizens and businesses as customers at the centre of a service ecosystem with many stakeholders, roles and systems involved. This entails the explicit identification and management of resources as valued assets, whether information resources (data sets, documents, models, processes, etc.) and technology 'soft products' (systems, applications and services. Best practice technology management requires a clear model and understanding of the stakeholders, actors and systems that comprise the overall service ecosystem and their relationships to each other. The model must be maintained and updated as stakeholders change over time and over the course of any development effort thus ensuring that requirements are continually evaluated and revised. Citizens and businesses, as potential customers, must be understood as stakeholders in the ecosystem with 'needs' (often imprecisely formulated) that they seek to satisfy through use of a service; but citizens and businesspeople are also human actors interacting with pieces of technology in precisely-defined interactions. These system-focussed interactions are a result of accurately modelling the processes required of both system and user in order to deliver a particular service capability conforming to explicit 'requirements'. Requirements in turn are revised and updated to reflect changes in stakeholder composition and concerns. Stakeholders are clearly distinguished and modelled – including the fact that they play different roles in different contexts (and which therefore has implications for role-based authentication). Stakeholder composition is also a good predictor of project risk – understand and modelling stakeholder types helps identify and mitigate risk. Stakeholder modelling underlines that every participant in an ICT development project is implicitly an intermediary representing diverse stakeholder interests in the deployed service. Service-Oriented Architecture (SOA) must be understood in its broadest sense – as a paradigm for organising and using capabilities distributed and managed across different ownership domains. In this sense, SOA is technology and platform agnostic and thus provides an appropriate foundation for the technology management framework. Disparate systems are weaved together as part of a coherent ecosystem while specific 'services', broken down into functional components, are identifiable as distinct from the underlying technologies that deliver them. This encourages ecosystem agility, allowing services to be mixed and matched, composed and re-used – it remains agile and flexible without being brittle, as with many systems where service functionality is tailored and tightly-coupled to addressing a specific problem. Ownership and governance – of information resources as well as ICT products – is federated across ownership boundaries and explicit service descriptions and contracts ensure that everyone knows the 'rules of engagement and use' when using any service. 'Identity Management' is correctly termed 'Identity Information Management' as identity itself is not technically managed but intrinsic to us as humans. It is often shortened to Identity Management, which will be used throughout. PRINCE2 is a process-based approach for project management, providing an easily tailored and scalable project management methodology for the management of all types of projects. The method is the de-facto standard for project management in the UK and is practiced worldwide. It is in the public domain, offering non-proprietorial best practice guidance on project management. PRINCE2 is a registered trademark of the UK government's Office of Government Commerce. The Skills Framework for the Information Age (SFIA) provides a common reference model for the identification of the skills needed to develop effective Information Systems (IS) making use of ICT, enabling employers of ICT professionals to carry out a range of HR activities against a common framework of reference - including skill audit, planning future skill requirements, development programmes, standardisation of job titles and functions, and resource allocation. The Skills Framework for the Information Age is owned by The SFIA Foundation: www.SFIA.org.uk. This is central to all multi-lingual thesauri, for example, where the core item of organisation is the concept, not the term.